When I was a little girl I have vivid memories in my Grandma's kitchen making egg noodles from scratch the night before our family dinner. I remember flour being everywhere, kneading the dough, rolling it out unevenly, and slicing through it with a butter knife to make long noodles. My favorite part was playing with the stringy noodles as we tossed them in more flour. I am not really sure if that was really what the recipe called for or if my Grandma was making the process more entertaining! She has a way of transforming the most simplest of actives into exciting processes with her imagination. She is building a legacy of creativity and we rarely have dull visit with her. We love spending the holidays with our extended families, but we aren't always able to travel for every holiday. It is really important to me to keep up the tradition of playing in flour, I mean making egg noodles from scratch, to feel like family is close during these special occasions. A couple months ago I discovered that I had a gluten intolerance! NOOOOOOO! 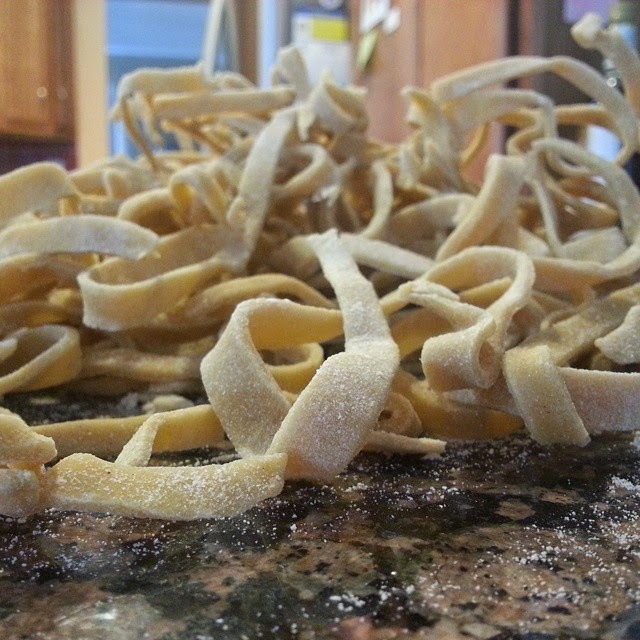 The thought of no egg noodle for Thanksgiving was unthinkable. So you can only imagine that I became quite familiar with gluten free flours with a specific purpose, to fulfill my carbohydrate cravings, especially homemade egg noodles. Gluten flours are quite pricey and definitely were a challenge to find with in our grocery budget. how ever we did find a great all purpose gluten free flour at Costco. We could purchase a 5 lb bag of Namaste Perfect Blend for under $10, YAY! So The night before Thanksgiving, equipped with Namaste and eggs my attempt to reinvent my family tradition commenced. Start with 2 cups of Namaste Perfect Blend flour poured directly onto a clean counter top or pastry mat. Divide the dough into fist size balls and roll out until it is 1/8" thick. Slice 1/4" strips with a butter knife, and repeat with the remainder of the dough. Let the noodles air dry over night and cook them the following day in broth and turkey drippings.